The Editorial staff at Country Music Pride would like to thank Christopher Marcum for his coverage and reporting of the All for the Hall Country Music Hall of Fame and Museum benefit concert. Christopher shares the following . . . The All for the Hall Country Music Hall of Fame and Museum benefit concert returned for the third time to Los Angeles last week. 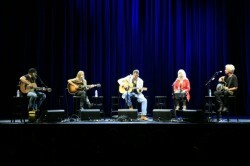 This year’s concert was held at LA Live’s Club Nokia where country music royals Vince Gill and Emmylou Harris made their headlining performance. Joining Gill and Harris on the stage were rising country star Zac Brown, and rockers Sheryl Crow and Kevin Cronin (of REO Speedwagon fame). The format of the $1000 per ticket concert was a “guitar-pull” – each performer switching off in a themed round-robin fashion. Zac Brown channeled some of the oddity of mixing his own nascent arrival on the music scene with the four other legends on stage by humming a line from “One of These Things is Not Like the Other.” Brown is just being ostensibly modest – he was nominated in nine categories for the 2011 Country Music Awards, more than any other musician, just a night before his LA appearance – and is likely on the path to a Hall of Fame title of his own. His joke might have been more apt for Crow or Cronin, both of whose sound diverges greatly from country music. Not so. Both rock artists mention their folksy roots as integral to their singer-songwriter careers in the pop-charts. Cronin surprised the audience in the first set with an acoustic rendition of REO’s “Keep on Loving You.” His voice is remarkably intact and was perfectly accompanied by his more twangy consorts. Easily the most folk-influenced artist on the stage was Emmylou Harris, Gill’s only threepeat guest at the show. Harris was inducted to the Hall just prior to her first All for the Hall performance in 2008. That same year, her mentor, the late great folk singer Gram Parsons, was nominated for induction but failed to garner enough support. A petition has circulated since then supporting his induction. Given the enduring legacy that Parsons spawned in Emmylou Harris (among others), one wonders whether her involvement with fund-raising for the museum could sway the Hall to reconsider inducting Gram Parsons. You can view more of the author’s work at his official website. Every Eric Church Melody Will Sound Like The Memory of This September Saturday Night Eric Church Concert in Boston ! Another great song performed by Crow that night was “Redemption Day” (also covered by Johnny Cash on American VI).